Leadville has its own Ski area called Ski Cooper. Its very seldom crowded and a great place to ski for the whole family. 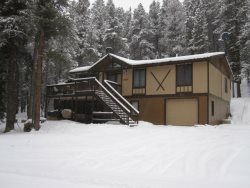 Affordable rentals and ski school for the kids make it an ideal place to ski. If bigger is better for you, Leadville is less than a 60 minute drive from 5 other ski resorts. Ski a lot for a little or ski a little for a lot. Its you dime. Click or call any of the sites below for hours, addresses, maps and more information about where to go in the snow and how to get there. Bill`s Sport Shop, Inc.Bill`s Sport Shop was founded in 1945 in Leadville, Colorado as a full-line ski shop complete with rentals for both alpine and cross-country skiing. We have expanded our lines over the years to include snowshoes, back-country equipment and snowboards to keep up with the ever increasing demands of outdoor enthusiasts. You can ski the �Heart of the Rockies� from Leadville for less than � the lodging cost at Beaver Creek, Vail, Copper Mtn., Breckenridge, or Keystone if you book during the �Peak Winter Season� even during the Holidays! Take a look at the map below for distance and directions from Leadville. Location: Leadville, Colorado "Heart of the Rockies"
Cooper is a Colorado ski resort located in the heart of Colorado�s majestic Rocky Mountains, with incredible views of some of Colorado�s highest peaks, including Mt. Massive and Mt. Elbert. Cooper is just a quick drive from Summit County and the Eagle County / Vail areas, and is only a few miles from Leadville, the highest incorporated city in the US, and one of Colorado�s most unique mining towns. At Cooper, we provide our guests with a ski get-away like you won�t find anywhere else. When you come to Cooper, you�re not just another customer; you�re a member of the Cooper Family. We pride ourselves on providing you with unparalleled skiing quality and the friendliest service, all at a price point that allows you to bring the whole family. Colorado skiing doesn�t get any more authentic! Leadville Ski Country- Let Leadville Ski Country plan and arrange your next skiing trip to Colorado. We offer personal service for a trouble-free trip. We rent skis, snowboards, snowshoes, & snowmobiles and have all the equipment you`ll need to make your next trip joyful. Vail Ski Resort - Coveted as one of the largest ski resorts in the world with more than 5,200 acres of skiable terrain, seven legendary Back Bowls spanning seven miles, and the most groomed terrain on the planet, Vail has been an extraordinary winter vacation destination for passionate skiers and snowboarders for more than 50 years.